Indians are, it appears, very accommodating people by nature! If someone throws a carcass on the road, rather than notifying the authorities, most of us take a detour. When a family blocks a road for organizing a private function, we merely curse before reversing the vehicle. When a shopkeeper displays goods on the footpath, we adjust and move on. Likewise when the illegal religious structures sprout in the middle of the roads, most of us don’t even take this into account. Soon the inconveniences caused become a part of our daily routine. We adjust to this change, either by taking a different road or leaving the house a bit early in anticipation of the chaos. Here I am talking about structures which are not unique to one particular religion; structures that metamorphose from nothing; structures which either become places of worship or remain symbols, though equally inconvenient. 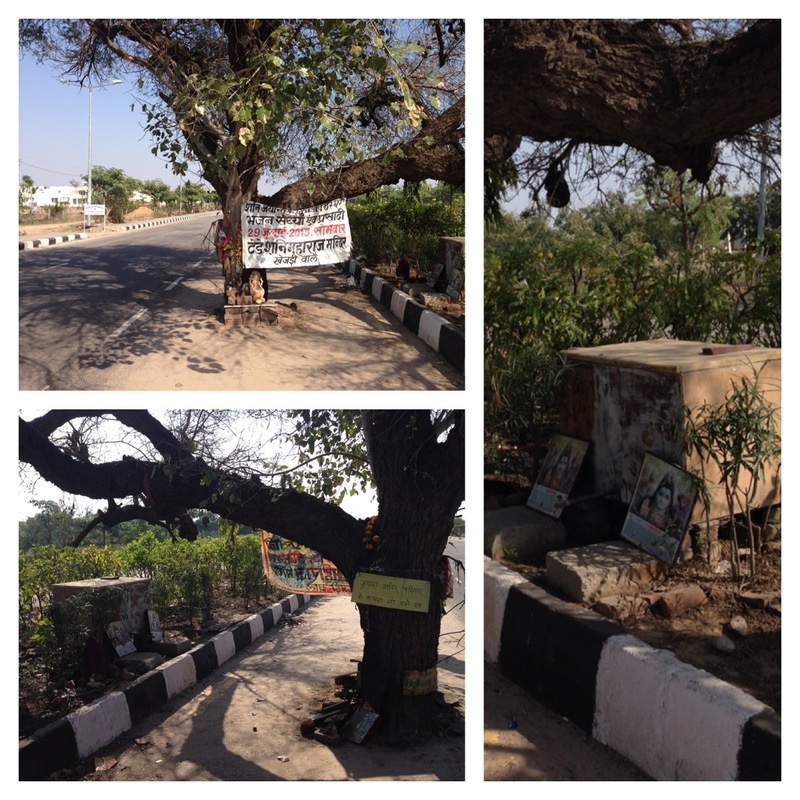 In a part of Jaipur, one particular structure started with a tiny red dot on the trunk of a tree. What followed was a sequence of events, which most of the people living in India are only too familiar with. After the magical appearance of the dot, some saffron clad people arrived at the scene, followed by a few idols. Before any passerby could notice the difference, the piece of land became a symbol, a place where people could come to pray. The whole charade soon became so solid that even the government authorities turned a blind eye to such developments for fear of ‘unpleasantness’ or ‘unrest’ among people. Accidents are a common occurrence because of the chaos that the structure in the middle of the road creates. The slow but steady increase in the area of the structure is overlooked. Imagine a straight road with a divider. Now imagine a structure in the middle of the road, occupying so much space that the road actually bends dangerously leaving one side with barely any space. Hence, a curve appears that is both inconvenient and dangerous: inconvenient because the space is too narrow for vehicles to pass comfortably and dangerous because if one is not careful enough, one would drive headlong into the structure. There is another structure, which has evolved through a similar sequence of events. This one is built on the land that is supposed to be the road. 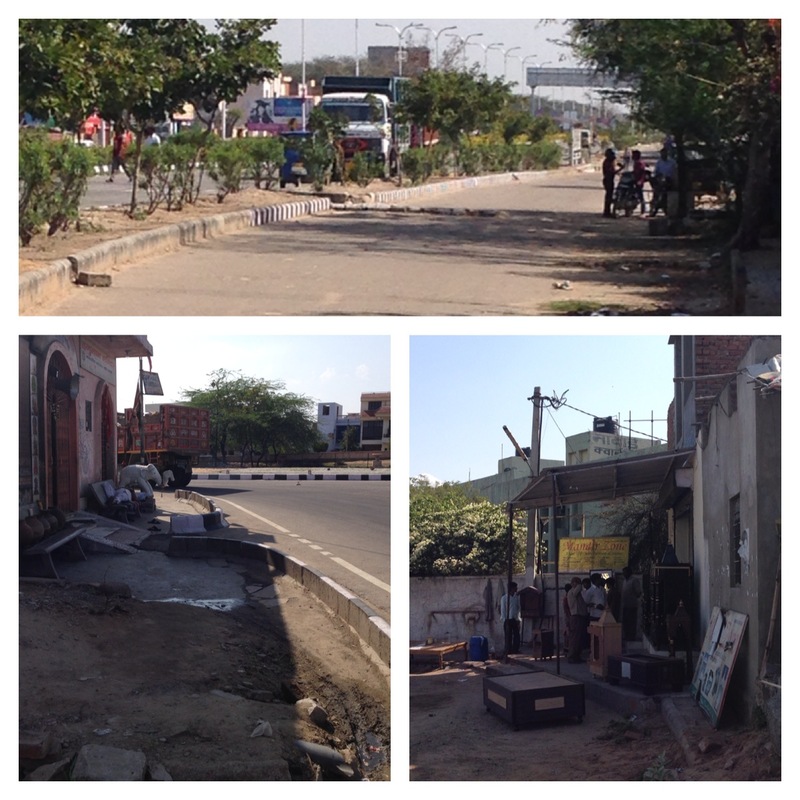 Moreover, the service lane, which is supposed to be running parallel to the road from start to finish, is blocked around the illegally constructed area, so people can sit outside the structure in the evenings. The structure boasts of a shop that sells more such miniature wooden structures that one can buy to put up in the homes! If we draw a sequence of the emergence of these two structures, the latter actually cropped up first and, it seems, the former took inspiration from it. They stand some 300 meter apart. They have been around for a decade now and they are getting ‘stronger’ with time. Around the same area, one can see another budding structure. Although it is in its infancy now, anyone, who lives in the area, knows this, too, has a bright future. How does one act when confronted with the religious authorities? A lot has changed in the last fifty five years. One of the things that remained unchanged in Jaipur was a small shop in one of the markets. When we speak of the landmarks in a city, we refer to those places which have been there for at least half a century or more. The shop I am referring to is a butchery. It is the kind of shop which generations of a family, from grandparents to grandchildren, frequent. For years, the shop had just a table, where the shopkeeper worked, and a stool, where the customer sat. Gradually, the seating arrangement became better and the counter now had a glass see-through shelf for displaying some items. Then one fine day the shop closed. A white paper pasted on the closed door gave the customers a telephone number and informed about a change in the shop’s location. Something out of the ordinary had to happen to make a half-a-century old shop change its location. And something did happen. An adjacent religious institution wanted the shop closed, despite the shopkeeper owning the land. In a eureka moment, the institution realized that no such ‘unholy’ things as meat could be allowed to be sold nearby. However, things are much more complex than that. The institution has decided to expand their constructed area. To expand, they needed to attract donors. In their effort to present an ‘unpolluted’ environment to the donors, the committee members of the institution forgot that many of the donors themselves have been faithful customers of the shop. The shopkeeper had two choices: to fight back by taking recourse to legal measures (which he is afraid of doing) or to give in to this unjust demand. Though hurt and angry, he chose to compromise. The politics of encroachment of public spaces is not associated with a single religion. Hence, it is not a question of one religion illegally acquiring land and stopping the authorities from doing their work.The issue here is how over the course of time, religion and religious politics have become synonymous and how the constitutional guarantee to practice one’s religion freely has been misused nonchalantly. Ms. Riti Das Dhankar is a freelance writer. She is doing her PhD in Psychology from Jaipur, where she completed her master’s degree in Clinical Psychology.